My mom is a total chocoholic. Her favorite cake is chocolate with chocolate buttercream. She snacks on Hersey bars. I think she might be addicted. That's why when I made this Lemon Blueberry Tart a couple of months ago, I was shocked when she went over the moon for it. It's that good ... it turned a chocolate addict to the lemon side. I made it again last weekend for Mother's Day and the whole family raved over it. 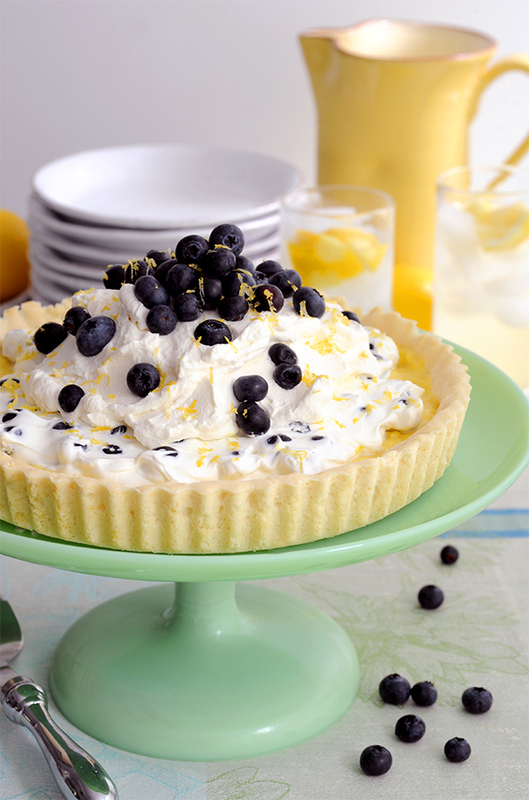 It has a flakey shortbread crust filled with a homemade lemon curd topped with sour cream, blueberries, whipped cream and fresh lemon zest. It is smooth and fresh, not-too-sweet and the perfect summer dessert. In the bowl of an electric mixer fitted with the paddle attachment, cream butter and sugar until light and fluffy. In a separate bowl, whisk together flour and baking powder. Mix flour mixture into butter with the mixer on low until dough is formed. Pat dough into a greased 9 inch tart pan. Bake at 350 for 12 to 15 minutes until lightly golden brown. Let cool completely. In a saucepan over a medium heat, whisk together sugar and cornstarch. Immediately add milk, egg yolks, butter and lemon zest, whisking well while adding each to avoid clumps. Cook and whisk constantly until mixture thickens and begins to bubble. Continue cooking and whisking for two minutes. Remove from heat and whisk in lemon juice. Let cool to room temperature. Pour into pie shell and refrigerate for at least 30 minutes. In a medium bowl, fold together sour cream and 1 1/2 cups of blueberries. Spread sour cream and blueberry mixture onto of lemon curd. Keep refrigerated until ready to serve. Top with fresh whipped cream, remaining blueberries and lemon zest just before serving.